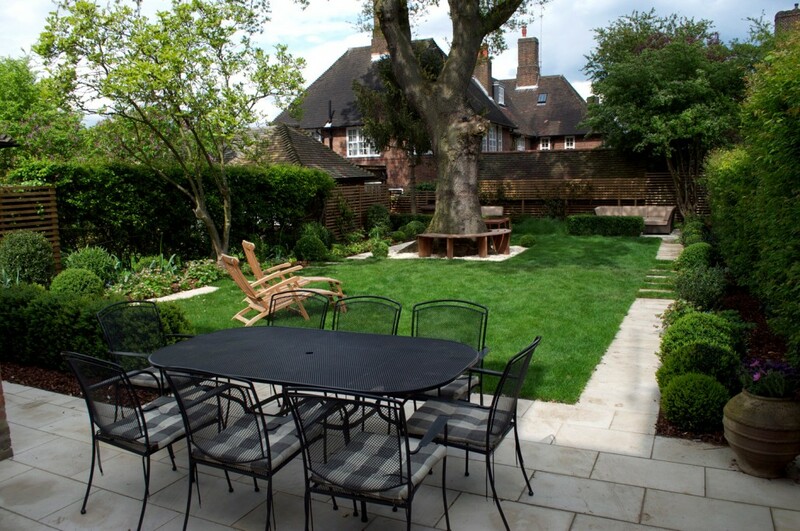 Garden landscaping in Hampstead, London NW11 (a conservation area). 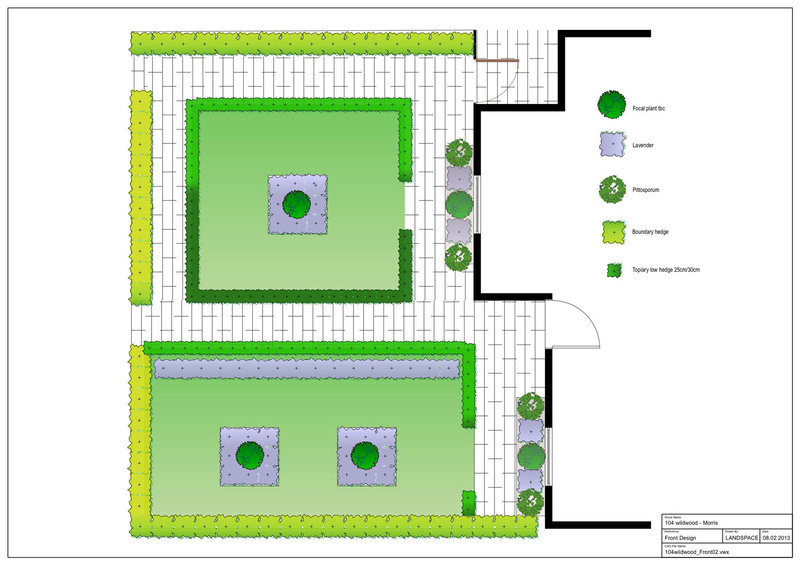 Materials: Kebony decking, softwood trellising, main patio, sawn buff sandstone paving, stepping stone paths, sun deck, Q lawns turf, French drains, soak away, circular tree seat, Claber pop-up sprinkler system, Hunza lights, Buxus hedging, Buxus balls and meadow planting. 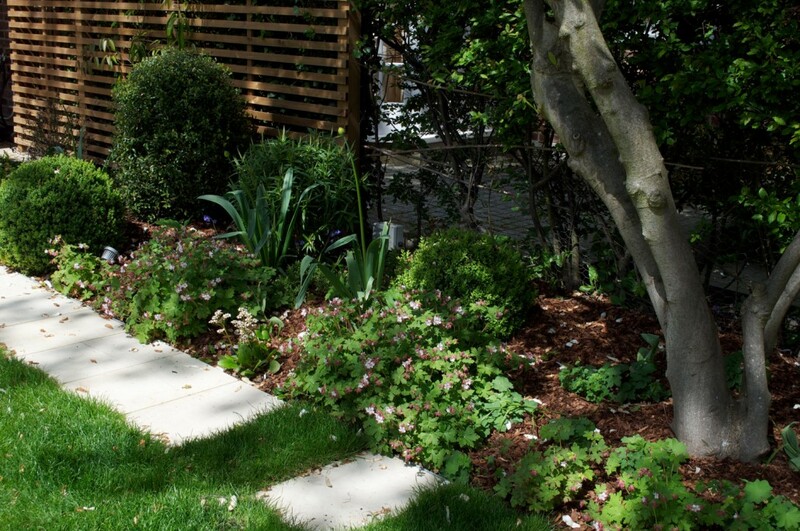 Plants: Bay balls, Hebe, Philadelphus, Pittosporum, Sarcococca, Buxus balls, Clematis, Parthenocissus, Trachelospermum, Alchemilla, Astrantia, Anemone, Bergenia, Geranium, Gillenia, Epimedium, Brunnera, Paeonia, Gaura and Veronicastrum. Brief: The house is situated in the Hampstead garden suburb and within a conservation area. 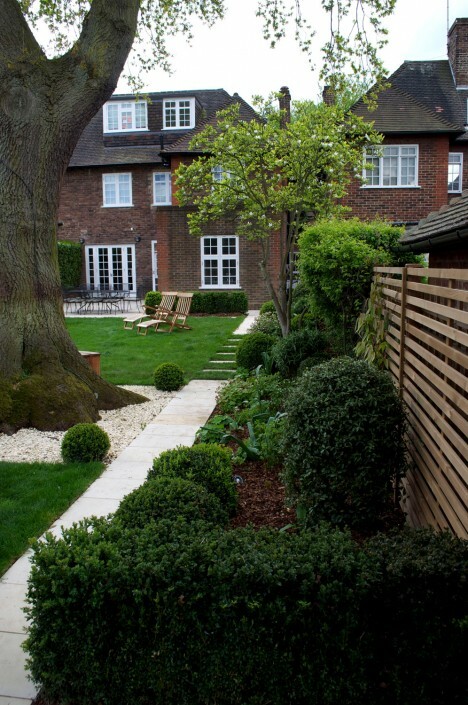 All changes have to be submitted to the Hampstead Garden Suburb Trust and there are strict limitations to what can be built in this area. 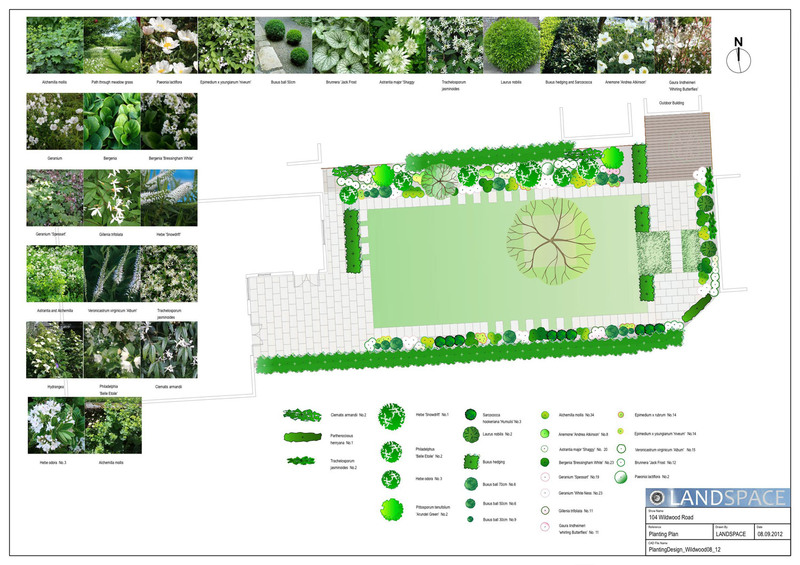 All designs have to be approved by the trust and local planning. In particular, all boundary markings must remain as hedge lines. You are not allowed to erect fences or walls along boundary lines. 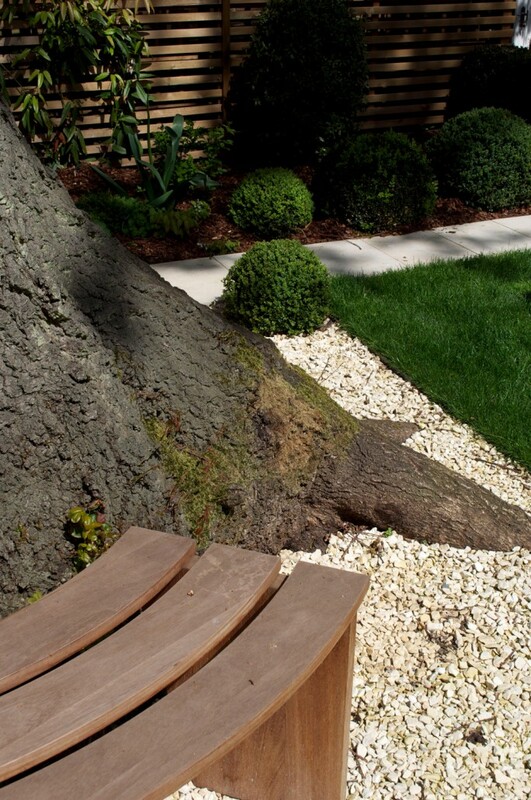 The trust is also very strict as to how much hard landscaping each garden in the conservation area can have. The garden is also the home of an Oak tree that is over 100 years old. It is about 50 ft tall and predominates the centre of the garden. Its canopy casts shade over a wide area of garden and is also responsible for an extensive leaf drop in autumn. 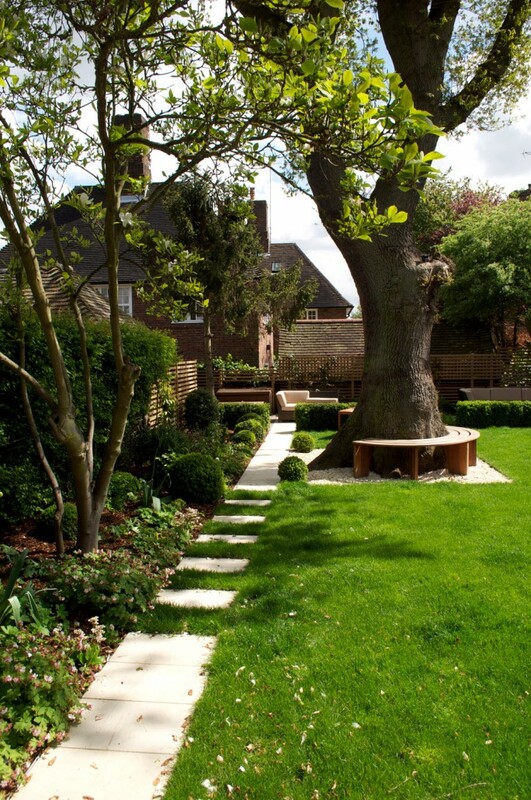 The oak tree is definitely a predominant feature to this garden. The clients wanted a multi-functioning space. 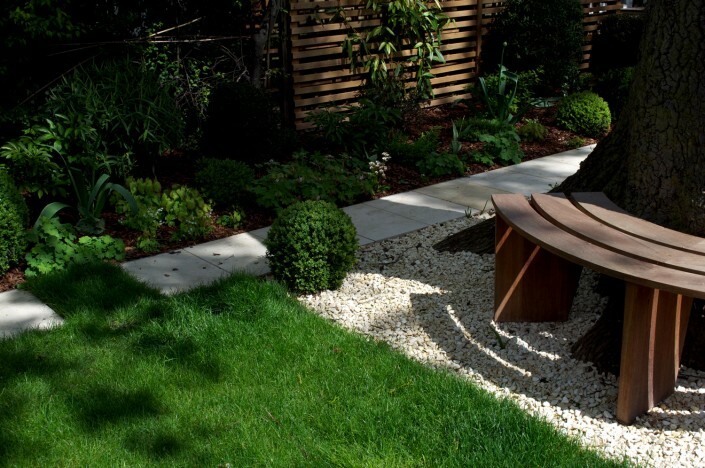 They required an area to entertain in during the summer months and an area to sit in to bask in the afternoon sun. 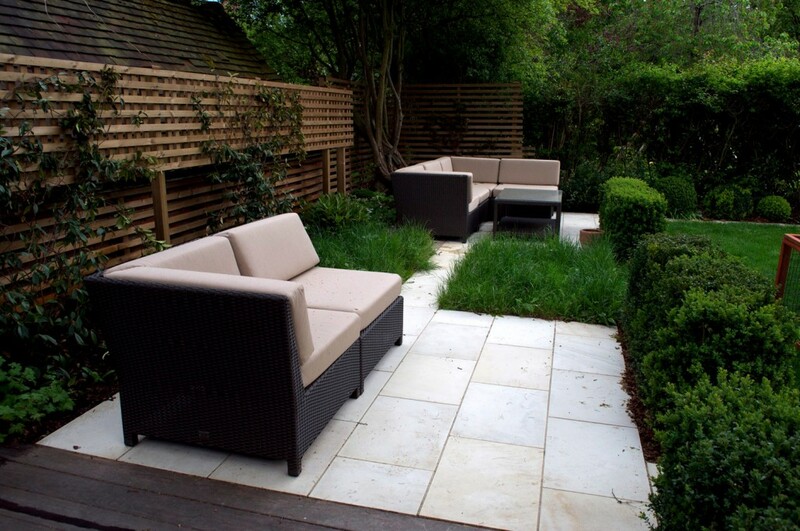 The client works from home and particularly wished to link the office space more practically to the garden. 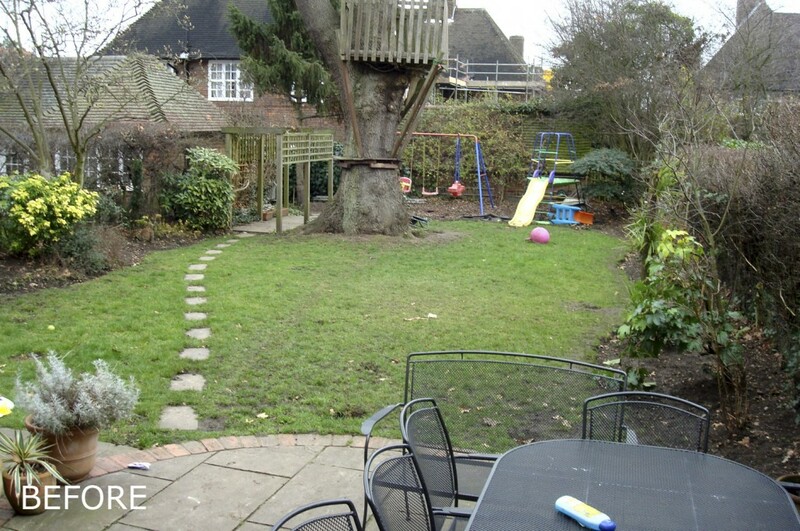 Keeping a large lawn was important as the client has two children and an active Labrador dog. 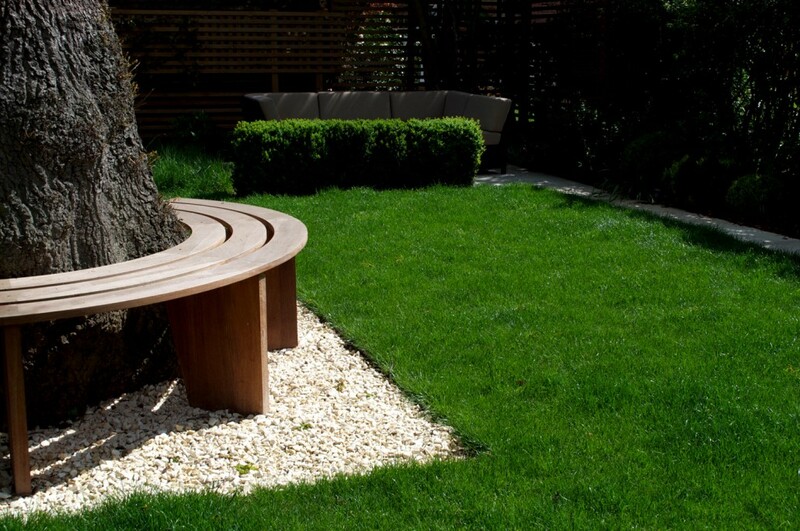 Mindful of planning restrictions, we had to carefully balance the two main seating areas. In particular, we had to limit the amount of hard landscaping at the bottom end of the garden. This we managed to reduce by linking two areas with a stepping stone path and diminishing its presence by surrounding it by meadow grass planting. 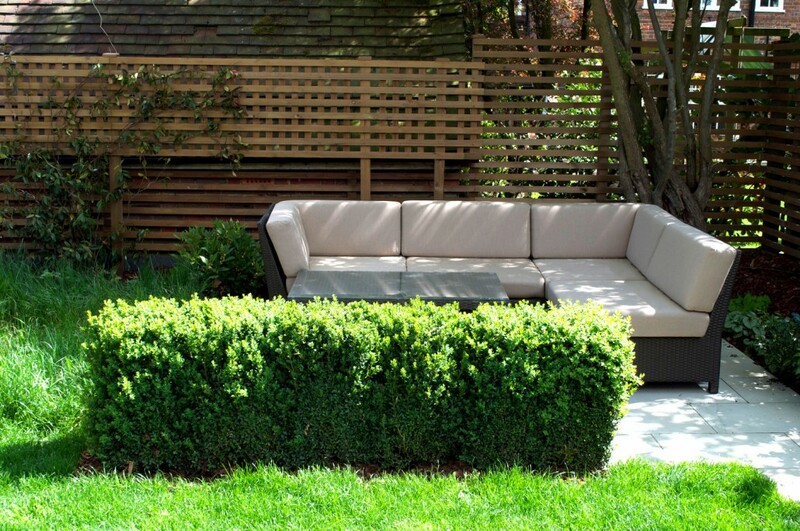 Buxus hedging was planted to help break up the garden into sections. 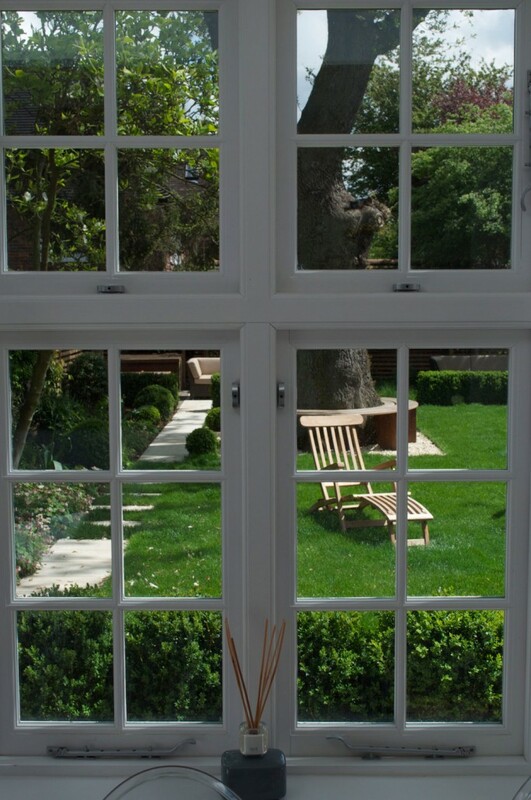 It was also used to create screening and privacy at the far end of the garden. The drainage across the whole garden was very poor. To improve drainage it had to be excavated and a network of branched French drains leading to a soak away had to be installed. The design also included hidden pop-up irrigation sprinklers and mood lighting. 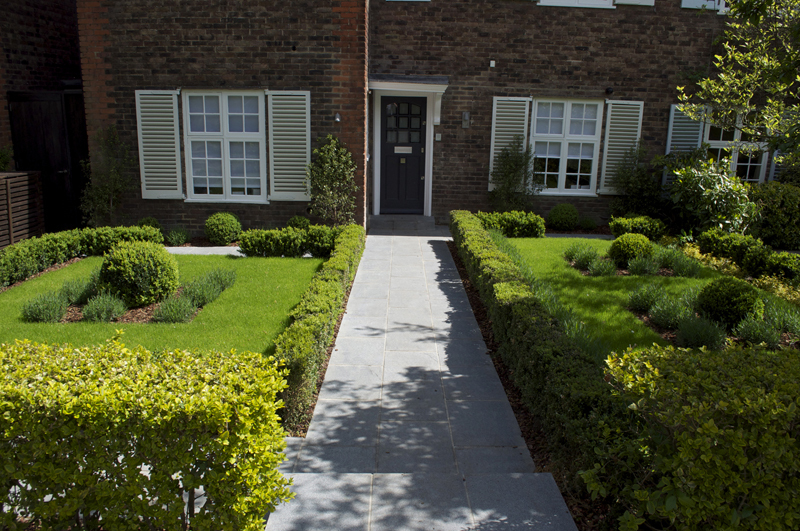 Materials: Blue grey granite paving. 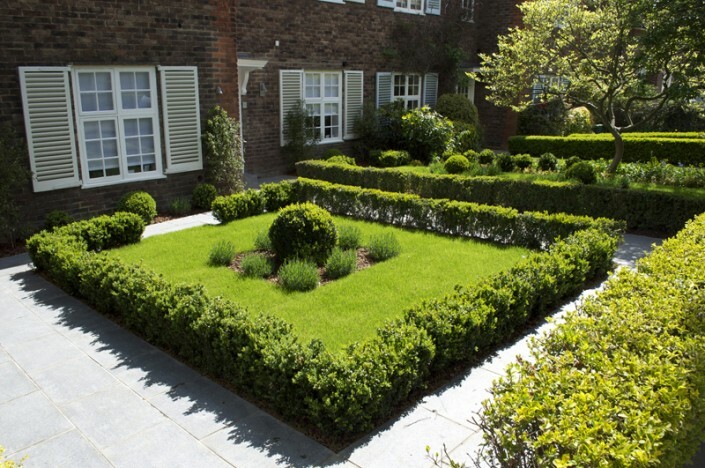 Plants: Low Buxus hedging, Buxus balls, Lavander hedging and Pittosporum. Brief: The client had a considerable amount of building work undertaken on their house after which the front garden was left in a poor state. 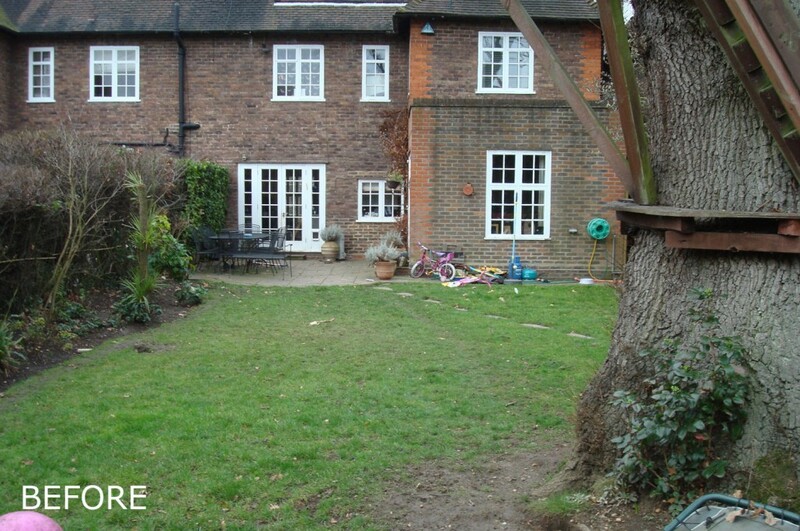 The majority of the space was originally just a lawn with crazy paving paths. Giving the restrictions of being in a conservation area, we suggested a fairly formal layout. Using the architecture of the building we centralised the design around it. 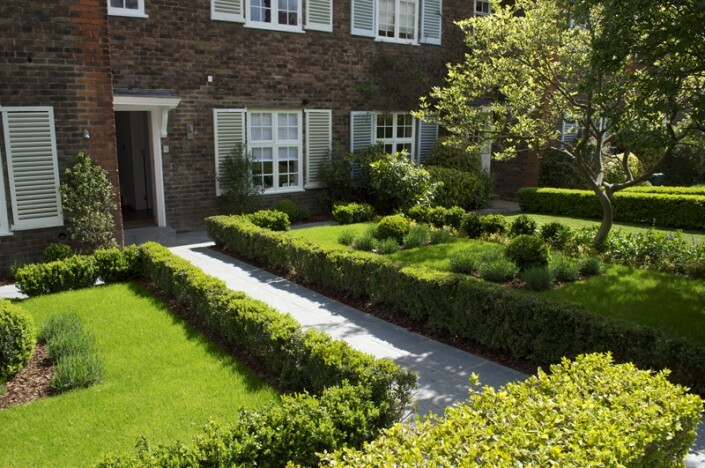 Two lawn areas with simple minimalist planting of low Buxus hedging, Lavander hedging, boundary hedge, Pittosporum.